This recipe comes from Smitten Kitchen. I’ve been a big fan of her work for a while now, but hadn’t gotten around to making any recipes off the blog until this week. After a weekend trip to the farmers market that resulted in me proudly carrying home 9 zucchini (but they were only $2 for a whole basket!!! ), I faced a reality check. My veggie drawer is full of zucchini…now what? Now, for heaven’s sake, go buy some zucchini! 1. Preheat oven to 200° F, and have a baking sheet on stand by – this makes a good amount of fritters. 2. Trim ends off zucchini and grate them either on the large holes of a box grater or using the shredding attachment on a food processor. 3. In a large bowl, toss zucchini with the sea salt and let it sit for about 10 minutes. Next, wring out the zucchini by wrapping it up in a clean dishtowel and wringing the towel. You can expect a lot of water to come out of the towel, but don’t worry, it won’t make your fritters dry or crunchy. 4. Place the squeezed zucchini back in the bowl (Warning! This part could get messy…), add a dash of salt and pepper to taste. 5. In a separate bowl, combine the flour and the baking powder. Add the lightly beaten eggs and dill and mix to combine. If the mixture gets too dry, throw in a little zucchini – see I told you it would still be plenty moist – and continue mixing. Then add the egg/flour mix to the shredded zucchini and stir well. 6. In a large heavy skillet, heat 2 tablespoons of oil over medium-high heat. 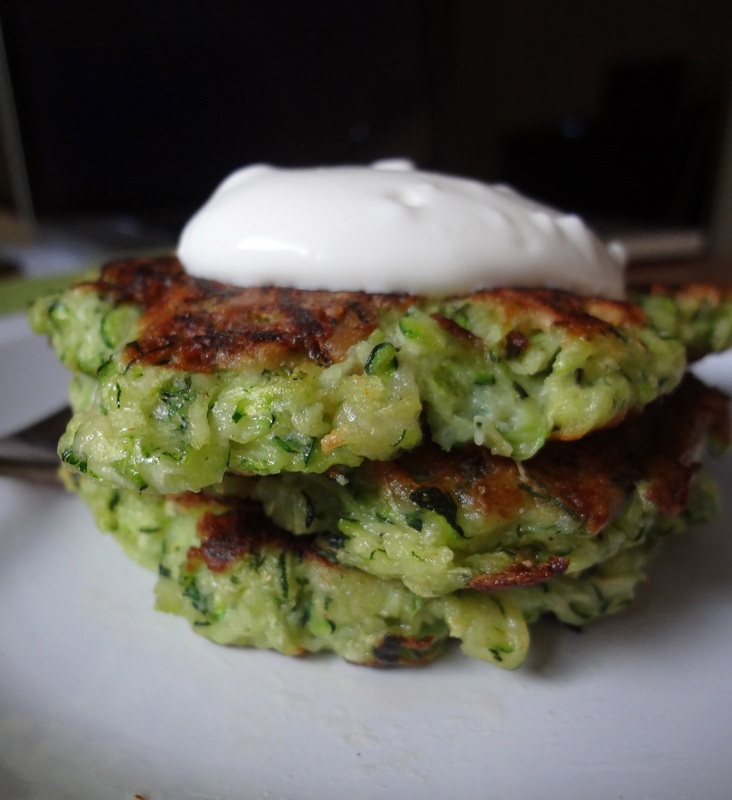 Drop small bunches (about 2 tablespoons or so) of the zucchini mixture onto the skillet. Don’t over crowd the pan, make sure they have plenty of space to breathe. If zucchini could breathe. Flatten them gently with the back of your spatula, and cook for about 3-4 minutes, or until golden brown. Flip the fritters, and do the same process on the other side. Make sure the pan stays well oiled to avoid sticky/burnt fritters. 7. For the yogurt – stir together the Greek yogurt and sour cream. 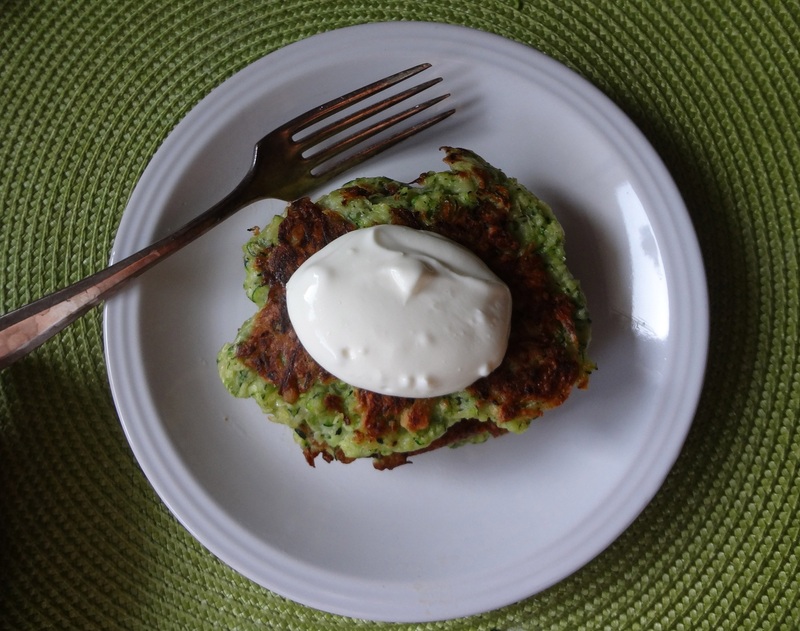 Crush the garlic into the yogurt/cream mixture and let it sit while you make the fritters. You’ll have some amazingly garlicky yogurt to top them once you’ve finished! Serving note: About half way through the process I realized I intended to eat these for dinner and there was no protein (except the yogurt) on the plate! I added 1/2 can of black beans to the remaining zucchini mixture (about half of what I’d started with) and they turned out great! One can of beans would work for the entire recipe as listed above. This entry was posted in Uncategorized and tagged appetizers, black beans, Cooking Light, Dinner, Farmers Market, fritters, Garlic, Healthy, Side dish, Summer, Vegetables, Vegetarian, Yogurt, Zucchini by theculinarycapers. Bookmark the permalink. They are seriously amazing. If you make them, don’t skip the garlic yogurt, it’s delicious. Kathleen, it has garlic in the name, it will not be skipped. Seriously, it’s like you don’t even know me.